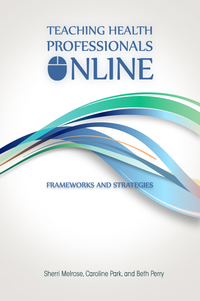 Teaching Health Professionals Online: Frameworks and Strategies is a must-read for professionals in the health care field who strive to deliver excellence in their online classes. Intended for a wide range of professionals, including nurses, social workers, occupational and radiation therapists, chiropractors, dietitians, and dental hygienists, this compendium of teaching strategies will inspire both new and experienced instructors in the health professions. In addition to outlining creative, challenging activities with step-by-step directions and explanations of why they work, each chapter in the text situates practice within the context of contemporary educational theories such as instructional immediacy, invitational theory, constructivism, connectivism, transformative learning, and quantum learning theory. Melrose, Park, and Perry also address other issues familiar to those who have taught online courses. How can a distance instructor build teacher-student relationships? How does one transform the assumptions often held by students in the health fields from the confines of the virtual classroom? Most importantly, how can the instructor support his or her students in their future pursuits of knowledge and their development as competent professionals? By considering these and other concerns, this handbook aims to help instructors increase student success and satisfaction, which, the authors hope, will ultimately produce the best possible patient care. Sherri Melrose teaches in the Faculty of Health Disciplines at Athabasca University. She has published widely on educating health professionals and is a winner of the Canadian Association of Schools of Nursing Award for Excellence in Nursing Education. Caroline Park teaches in the Faculty of Health Disciplines at Athabasca University. She developed her first online nursing course for the University of Manitoba in 1997 and has subsequently developed and taught many courses for Athabasca University. Beth Perry has worked as both a nurse and an educator in medicine, oncology, and palliative care. She has been an Associate Professor of Nursing and Health Studies at Athabasca University since 2001.